On the heals of Orbital ATK’s latest Cygnus resupply mission, Roscosmos’s Progress 63 launches this afternoon from the Baikonur Cosmodrome in Kazakhstan at 12:23pm ET. Rolled out to the pad early Tuesday morning atop its Soyuz launch vehicle, the newest Progress cargo vessel, designated MS-02, will transport more than 2,000 kg worth of supplies to the International Space Station. In preparation for Progress MS-02’s arrival, the station’s crew packed one of its predecessors, Progress 61, with waste and other garbage before undocking the spacecraft Wednesday morning. Moving a safe distance away from the station, Progress 61 is expected to burn up over the Pacific Ocean on April 8; coinciding with the targeted launch date for a third resupply vessel in as many weeks - SpaceX’s Dragon spacecraft. The departure of Progress 61, which has been docked at the station since October 1, frees the Zvezda module’s aft port for the arrival of Russia’s newest Progress vehicle. 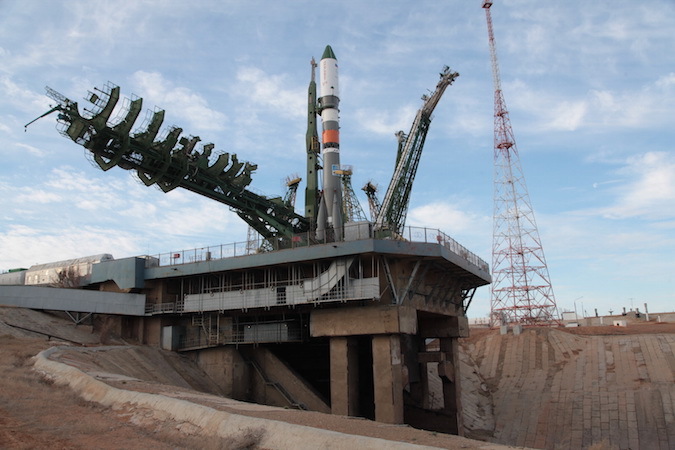 Following liftoff, Progress 63 will complete 34 orbits over the course of about two days before reaching the ISS. During the deliberately extended rendezvous time, ground crews plan to test new navigation software and communications equipment for use on the next generation of Progress and Soyuz spacecraft. Utilizing these upgrades, the spacecraft’s autopilot will rendezvous and dock with the station April 2, at 2:01pm ET. ISS configuration following the arrival of SpaceX's Dragon spacecraft April 10. Cygnus OA-6, which launched from the Cape Canaveral Air Force Station (CCAFS) March 22, docked with the International Space Station Saturday morning carrying the first round of much needed supplies and experiments for the Expedition 47 crew. With the arrival of Progress 63 on April 2, and SpaceX’s Dragon resupply craft scheduled to dock April 10, nearly 12 tons of cargo will have been delivered to the ISS during what is likely the station’s busiest time in history; bringing a total of six vessels docked to the ISS for the first time since Space Shuttle Columbia’s departure in February 2011. Progress 63 is expected to remain at the station until mid-October, when it will meet the same fiery demise as its Progress predecessors: filled with trash, burning up in Earth’s atmosphere. LIVE launch coverage of the ISS Progress 63 Cargo Craft begins at 12:00pm ET on NASA TV. LIVE Docking coverage will begin April 2, at 1:00pm ET on NASA TV.